Ashroy Foundation is a voluntary female headed Organization established by the initiative of devoted group of courageous women & social workers at south west part of the Bangladesh, considering the overall situation of women and children including their inhuman condition, oppression, inequality in the family as well as in a society with lack of entrepreneurial support and inadequate back up support. The General Body of Ashroy Foundation consists of 21 members of female which 7 represent in Executive Committee who is responsible tostrategic leadership towards achieving execute the plan of action for achieving the organizational vision and mission. It is registered with the Directorate of Women and Children Affairs, Directorate of Youth Development and the NGO Affairs Bureau. Ashroy Foundation follow its own policies which major is Human resource development policy, Financial and accounts management policy, Procurement Policy, Gender policy, Contingency plan, Child protection policy, Conflict of interest guideline, Vehicle Management policy, fraud, bribery and corruption policy, Strategic plan and so on. Ashroy Foundationsmain programmatic areas areClimate Change, Disaster Risk Reduction DRR and Emergency Response, 2.Food security & Livelihood and life skill, 3.Agriculture for sustainable livelihood, 4.Education for Sustainabledevelopment 5. Water Sanitation and Hygiene WASH, 6. Primary Health Care and Nutrition, 7.Human Rights and Social Justice and 8.Research.Above these programmatic/ focusing areato strengthen human and material resources through different interventions at community level specially for female part consider the cross cutting issue of Disaster risk management and Gender.Besides, Capacity strengthens of local organization in humanitarian aspect as well as different humanitarian stakeholders. All projects are design, Planning and implementation level should be gender responsive. 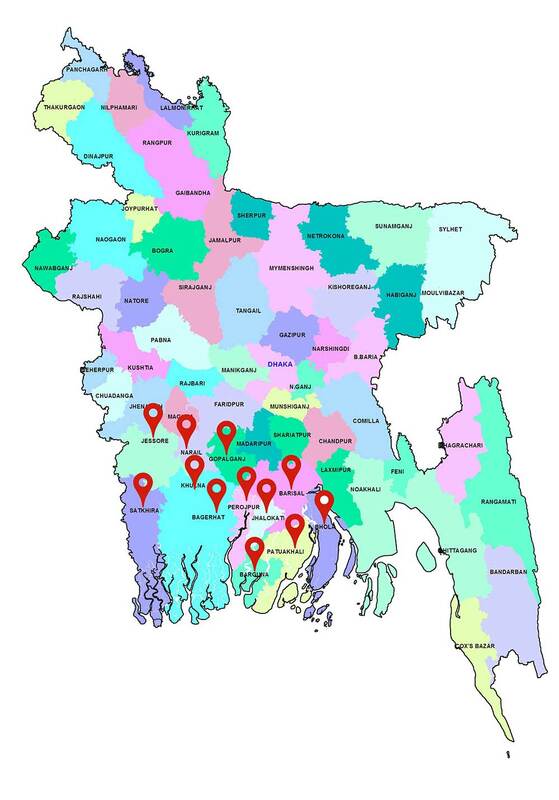 Under this programmatic area we have projects for direct implementation and through partnership system which funded by different Bi-lateral Development organization , UN Agencies ,Different Department/ministry of the Government of Bangladesh, International Organization, Joint collaboration with national organization, private sectors and universities. In this connection Climate Change, Disaster Risk Management DRM, Emergency Response and rehabilitation issue is more emphasis in the context of coastal belt area. Ashroy Foundation working approaches are right based and service delivery system & research. to access, plan, execute and manage integrated risk reduction measures in the line of climate change adaptation. The target groups were also trained and established linkage with the concerned service providing departments for acquiring knowledge, sharing ideas and skills on their livelihood issues. Besides, Emergency response, early recovery and Rehabilitation issues work on Cyclone Sidr, Alia, Mohasin and Resma, Water logging, Flood and tornado. It is noted that our preparedness work is ongoing in several projects. Ashroy Foundation is also expertise on sustainable agriculture, integration of agricultural activities for coping with the changing environment e.g. supplementary/alternative crops, stress tolerant crops cultivation, integration of different crops in the same land for diversification and disaster resilient livelihood. It also promoted some innovative crops like sunflower, maize cultivation and Malta in the south west coastal area Bangladesh where generally 01 crop are receivable due to salinity and irrigation obstacles. Non formal education , pre-primary, drop out, working children education are also one of the field in which AF gained knowledge and experienced over the mentioned timeframe. Women, disaster affected community and disadvantages groups’ livelihood were one of considering issues where Ashroy Foundation is involved through promoting income generating activities e.g entrepreneurship development, small agro farming, livestock rearing, aquaculture with horticulture and required skill development training providing to the community vulnerable groups. Ashroy Foundation engaged in evidence based advocacy, Lobbying and influencing with policy makers, politicians, journalist and other concerned organizations as well as local community those who are key actors of reducing disaster and vulnerable situation of climate change issues towards policy and practice change which would maximize the benefits of the marginalized segment of the society. Ashroy Foundation also developed its crosscutting issue by mainstreaming disaster risk reduction in long term development policies and procedure in context of its own ‘disaster-resilient culture’. It carried out research to generate grassroots level concrete evidence and social change process for effective advocacy and engaged in networking with likeminded organization and exchange knowledge& views also. Ashroy Foundation also gained experience and expertise on documentation, reporting, BCC/IEC materials development, carry out CRA, PRA, baseline study, program cycle management PCM, review and evaluation, participatory monitoring, need assessment, data management, Community Managed Disaster Risk Reduction CMDRR, value chain, market linkages, community business plan, improved land use and natural resource management ,Research etc.It tried to create an alternative opportunity for the women through capacity development and linking them with the market. The development activities of Ashroy Foundation are designed to respond the community need those included eradicate extreme poverty, achieve universal primary education, promote gender equality and women empowerment, reduce child mortality, improve maternal health, and ensure environmental sustainability for disaster resilience society, and advocating towards developing a global partnership for development. Ashroy Foundation is also able and capacitated to implement activities as per the line of recognized national and international standard and policies as like as Standing Order on Disaster SOD, National Plan for Disaster Management NPDM, Bangladesh Climate Change Adaptation and Action Plan BCCAP, Sustainable development goal (SDG), Poverty Reduction Strategy Plan PRSP, SPHERE standards, Hyogo Framework of Action HAP etc with a view to up holding peoples dignity and right and maintaining recognized standard, transparency and accountability. Besides also follow the present policy and guideline of Bangladesh Govt. in every sector as well as organizational policy and procedure. Geographical coverage of the organization. Executive Governance: 07 (Seven) persons. All are female persons. Website address for more details.